A cautionary tale: Whenever one thinks she or he has reached the end of the metaphorical line and is dangling by the very last fibers above the abyss, know that if you’re successfully converting oxygen to carbon dioxide, you’ve still got a fighting chance. Heck, maybe one day we’ll finally get the high-quality hemp rope N.O.R.M.L. promised us back in the ’90s. And so, as we said in that post, that was all she seemed to write…err, carve into linoleum and press into the street. But (yes: there’s always a big but) how wrong a blogger can be! Within mere blocks of those two specimens, we encountered yet another pair of wayward street tiles–apparently from the very same hands. The first of these is on Smithfield Street, right before the bridge; the other just around the corner and up a block on the Boulevard (at Cherry Way). 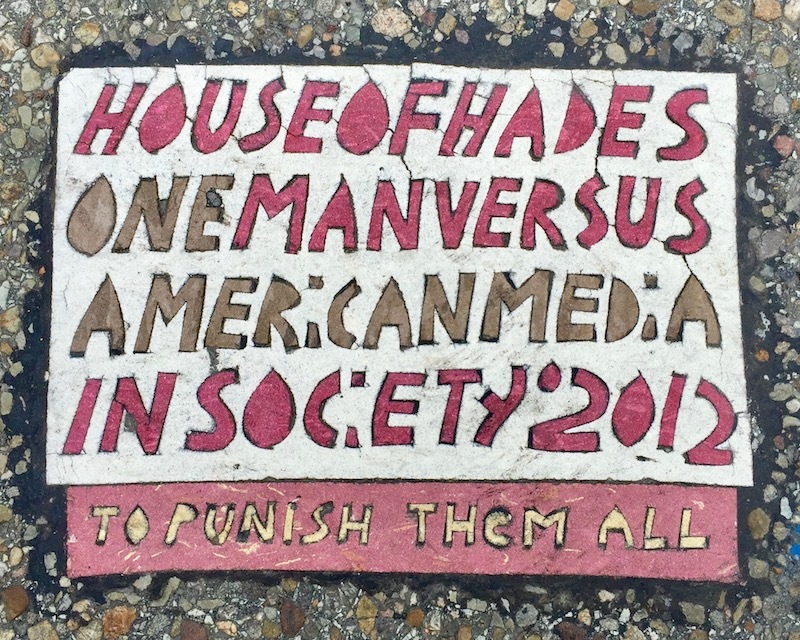 The former (we’re calling it House of Hades tile #3) includes the exact same message as tile #1 from the previous post: House of Hades / One man versus American media in society ‘2012. This one also has the added ominous zinger To punish them all. House of Hades tile #3, Smithfield Street at First Ave.
Tile #4 is a little more difficult to parse. The Toynbee half of it contains what we’ve come to recognize as a naked lady’s shapely gam across the top (there was probably a right leg to go with this left, but it’s gone now), plus some of the familiar big headline text: House of Hades / The resurrection of Toynbee’s idea in society ‘2012. It also contains an extra stanza in relative fine print with the disturbing message I must work harder to punish these butchers for all that they’ve done. 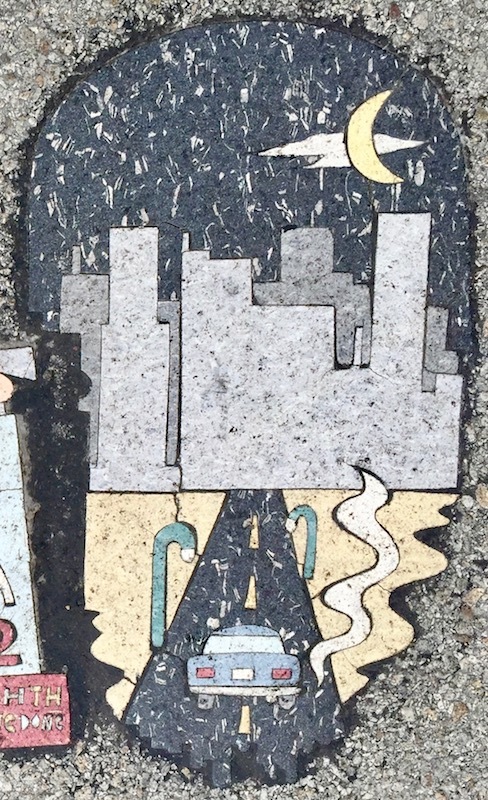 The most unusual thing about #4, though, has to be that it’s also immediately abutting/overlapping yet another linoleum street tile of an entirely different mood and design. This one, vertical in composition with rounded corners, features a night scene in one-point perspective of a car driving toward a stylized big city skyline [notably not Pittsburgh]. A crescent moon hangs overhead against the star-speckled black sky. It’s probably safe to say this nightscape is not the work of either the Toynbee or House of Hades folks. Aside from the medium itself, it just has none of the tell-tale style elements or apocalyptic messaging. That said, it sure is curious that the two ended up where they did. With all the available, naked pavement out there, how do two road tiles lie nearly right on top of each other? Can’t we all get along! 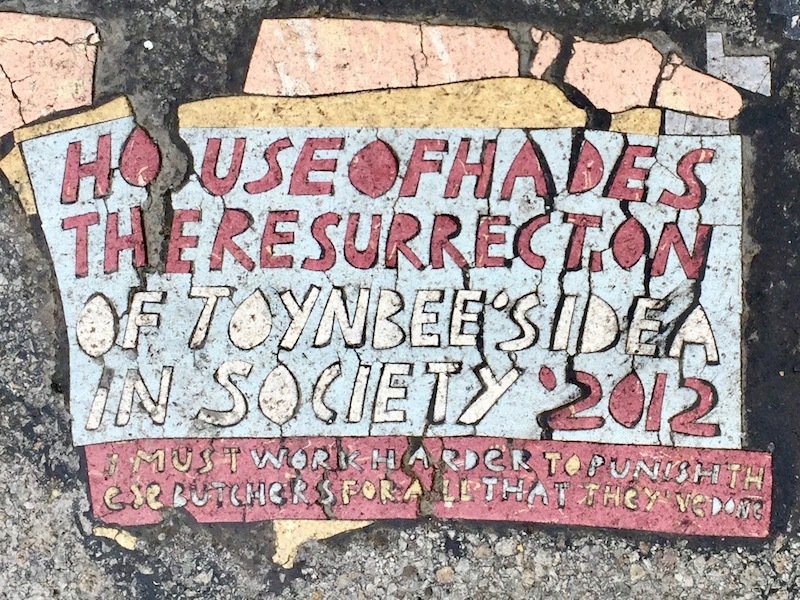 Are these really the last of the Toynbee (inspired) tiles in Pittsburgh? We sure hope that isn’t the case and we’ll not make the mistake of trying to declare such a truth again. Fool me twice, as they say. Plus, like that desperate hero watching the fraying strands of her lifeline unspool from its anchor above, we like to think there’s a little more life left in these streets and–with it now legal in 30 states–hemp is on the way. We haven’t given up just yet. Never gets old to read about Toynbee tiles. Did you see the documentary film about them? I might note the two tiles together could be an example of sidebusting, a common street art phenomenon, a way for a lesser artist to get recognition. The two tiles next to each other are without a doubt House Of Hades, he has layed similar tiles in other cities. They start out as one tile, but sometimes get moved around in the process of adhering to the pavement. 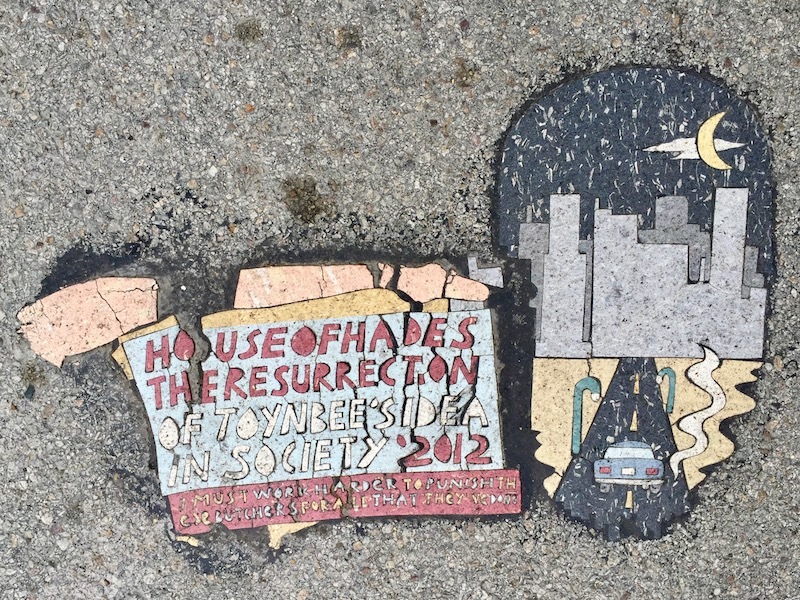 House of Hades has made incredible works of art in his tiles beyond the text based messages, even some cursory research would show countless examples that have been photo documented all over the country on social media.